He was born of two mothers in a French megacity. The city, like many others, was huge and overcrowded (not to mention overcrowded). Their neighborhood was a number rather than a name. And was on the edge of Paris. Paris which was obviously forbidden to access, due to lack of space. He did not stay long in this environment, he and his parents quickly moved into an uncle's house in Asia. The latter had the right to a better quality of life than others due to his exemplary military service. And also the long line of military volunteers in his family. So the uncle welcomed them with open arms. He was single and childless. So he welcomed little Thomas as his own son. Like all other young people of his age, he went to school and had a better childhood than a child on the basic level. But clearly, obviously, below any rich man. Inspired by his uncle's experience, he joined the peacekeeping forces. His experience was....disastrous. His training was horribly long and impersonal. Coaches and sergeants train thousands of soldiers at the same time without really taking the trouble to distinguish the values of each. His first mission was simply suicidal. It is deployed in the middle of an intense war zone, where no less than 6 rebel and terrorist groups were fighting over the area. Not to mention the local government that was committing atrocities. His equipment was outdated and his comrades demoralized. Almost all of them were just to do their contract in order to get the privileges of those who did military service. And thus have a better life on the basics. Not giving up, Thomas continues to fight and does not leave the ship unlike his colleagues. He ended up being promoted to higher positions. Most of them in administration. It was that or a certain death on the battle lines. The situation changes radically when several terrorist groups join forces and launch an attack on the basis of their mission. In a few weeks they lose a considerable number of men. And the highest officers in the army are beginning to think that this mission is being mismanaged. Support troops are deployed and forces on site evacuate. Including Thomas. Taking advantage of the fact that the army absolutely wants to make this history forgotten, Thomas made a request to integrate the space academy on Luna. 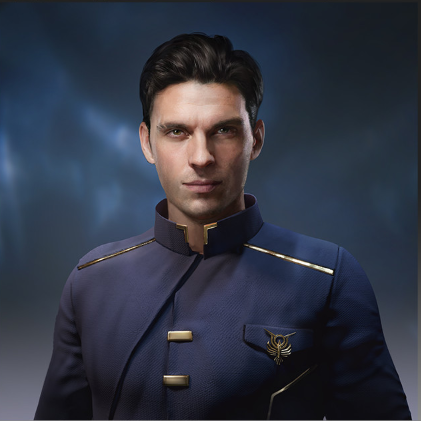 Graduating, he started as a simple low-ranking officer on different ships. His career is not glorious or interesting. He slowly increases ranks and responsibilities. Change ships according to the desires of superiors. His versatility favours him in various tasks and as a trustworthy man. The Naval Intelligence Office trained him to become a versatile and multi-tasked officer. His mission becomes to plug the holes where he has them. Depending on the missions and his duties. We finally place him in a specific position. The one of aide-de-camp. The Racher officer is a rather argumentative commander and proud of his successes. A man that everyone was betting on whether he would end up as an admiral or even an admiral of the fleet. He is attached to the service of a rather arrogant commander who is proud of his successes. A man that everyone was betting on whether he would end up as an admiral or even an admiral in the fleet. For several months, he served on his ship in search of pirates. Especially a very active band. After a long hunt, they end up intercepting them by surprise during one of their pillage. Rather than back off and call for support. The commander prefers attacks. Arguing that backing away to wait for reinforcements would be a stupid act. The result is known, the warship quickly finds itself in trouble. The pirate ships succeeded in hitting the UNN ship hard. Thomas, following the protocol, puts on a combiner. Since a part of the ship is already ventilated into the void of space. Exactly 33.45 seconds after putting on the full suit. The command bridge is ventilated. Thomas and the entire bridge is ejected. The captain died, as did almost the entire crew. Thomas could do nothing but drift in space by watching his ship being looted by pirates (who must be pretty ecstatic at the time). It survives thanks to the emergency system of its suit and the emergency beacon. A UNN team dispatched to the site recovered him and saved his life. This episode could certainly be the most traumatic of his life. This page has been seen 71 times.